SystemDesigneruses a unique bus system to encode and transfer SystemDesignerspecific data from one SystemDesigner component to another. 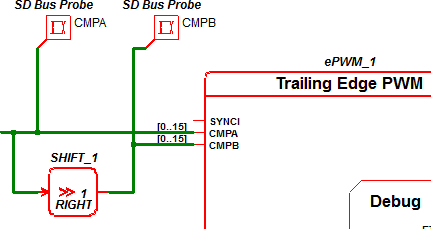 Although these buses have the same graphical look as other buses on a schematic, they need to be treated differently for probing and connecting to other devices. You first need to determine if the bus is a SystemDesignerbus. A bus connects the output of one SystemDesignercomponent to the input of another SystemDesignercomponent. For example, this condition exists in the tutorial example at the interconnection between the output of the ADC and the two probes as illustrated below. The other condition that determines a SystemDesigner bus is if the bus is connected to the output of a SystemDesignercomponent that drives another SystemDesigner component. The bus connected between the right-shift output and the ePWM-CMPA input pin is a SystemDesignerbus. The other bus in the this schematic is also a SystemDesigner bus connected to the output of a SystemDesigner adder block. 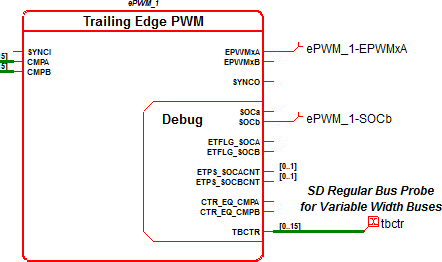 The output bus pin on a device has the [0..n] label where n is a positive integer, such as the debug pins on the ePWM symbols, shown below from the global start of conversion ( SOC ) example. 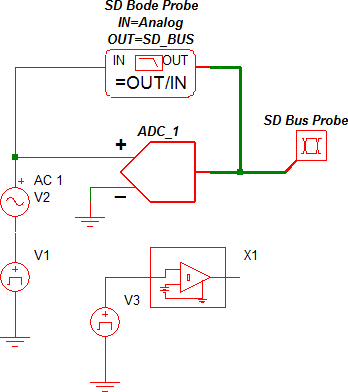 In this schematic, the tbctr probe is on a regular bus, not on a SystemDesigner bus. Compatibility between regular and SystemDesigner buses. The above examples show that SystemDesignerbuses can be used to drive regular bus inputs on other SystemDesigner components. During an integer-sampled data simulation, the SystemDesigner buses are 32-bit buses in a two's complement format. As such, the output is compatible with an unsigned bus as long as the value of the bus does not exceed 2^31. Currently, only the SystemDesigner ePWM module has non-SystemDesigner buses. On the other hand, regular buses cannot be used to drive SystemDesigner buses because regular buses do not properly format the SystemDesigner data for the double-precision floating-point simulations. 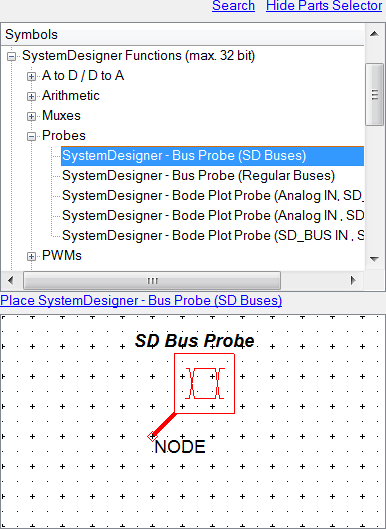 The SystemDesigner - Bus Probe (SD Buses) is the probe used in the SystemDesigner tutorial example and is the probe that you will use most often in SystemDesigner . Use this probe for any buses which are SystemDesignerbuses. This probe does not produce curves for non-SystemDesigner buses, nor does it produce curves for any non-SystemDesigner simulations. 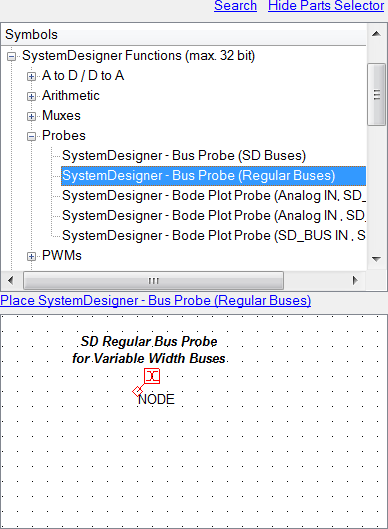 The SystemDesigner - Bus Probe (Regular Buses) should be used on all non-SystemDesigner buses in any SystemDesignerschematic. The buses include any buses which are connected to the output of a regular SIMPLIS digital component. These three Bode plot probes have edit dialogs identical to the conventional Bode plot probe used in SIMetrix/SIMPLIS.